The Kobo Arc 7 is Kobo's 3rd seven inch Android tablet. It was introduced in August 2013 and shipped about a month later. I bought it in early January 2014 from Best Buy for retail ($149). This is by no means the best tablet on the market, but that's okay. This tablet wasn't built to compete with all the other tablets on the market; it was made for Kobo customers and folks who want to read on their tablet. At first glance the Kobo Arc 7 looks like your typical Android tablet. It has a 7" screen with a camera centered over one of the short sides. There's a single speaker on the back, while the power button and microSD card slot are on the upper edge. The volume buttons are on the right edge, and the USB port, HDMI port, and headphone jack are on the upper edge. It looks like a regular Android tablet, but then I picked it up. I have held many Android tablets over the past few months and none were less physically appealing than the Kobo Arc 7. This tablet forgoes the curved shell found on Kobo's earlier hardware (and many other Android tablets) in favor of sharp corners and an angled rear shell. 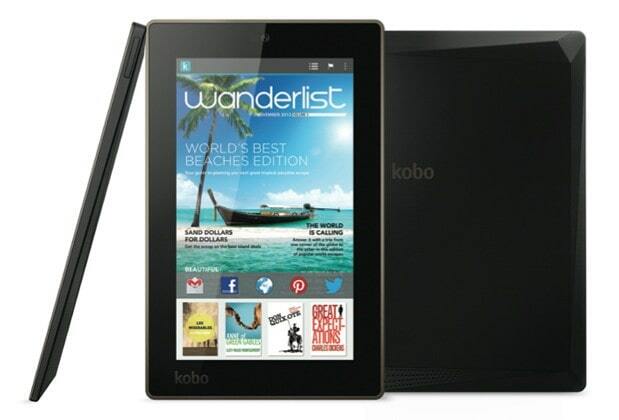 Kobo started this "no edge left soft" trend with the release of the Kobo Aura HD in early 2013. You can see it on their newer 6" ebook reader, the Aura, as well as on all 3 tablets launched this year. While it is visually eye catching, on a tactile level it is unappealing. That's what I thought when I laid my hands on the Aura at CES 2014, and that's what I think of the Arc 7. But I will give Kobo credit for sticking with a generally good build quality, and for having the insight to distributing all of the buttons, ports, and card slots on several edges towards the upper half of the tablet. For example, having the USB port on the upper left edge is a better design than putting it on the bottom edge or the upper edge; it's more convenient to hold the tablet while it is charging if the cable is draped out to my left than if it is plugged into the top or the bottom of the tablet. Sidenote: To be fair, Kobo isn't the only tablet maker to follow this trend; Amazon used a similar design aesthetic when coming up with the third generation Kindle Fire Android tablets. I briefly owned a Kindle Fire HDX but not long enough to develop a dislike for the sharp edges. Like many budget tablets, the Kobo Arc 7 is equipped with single camera on the front and no camera on the back, along with the the same basic camera app as on most budget Android tablets. The VGA resolution camera is intended for video chatting and selfies, and it pretty good. I took numerous pictures of myself and all were recognizable. They were low resolution images, yes, but still recognizable. You can't always make that claim with cameras on budget tablets. At 1024 x 600, the Kobo Arc 7 has the same screen resolution as on most budget Android tablets. It's not the best quality screen, but it's also not the worst. All in all, I would say that the screen on the Kobo Arc 7 is about equal to the screen on the Hisense Sero 7 Pro. I am making that comparison so I can say that neither screen can match a premium screen like the one on the Kindle Fire HD, but the shortcomings are only obvious when you have the more expensive tablet laying next to its cheaper competition. Otherwise you probably won't notice. The backlight on the Kobo Arc 7's screen is bright enough to double as a flashlight, though it's not quite as bright as the KFHD. When viewed head on the colors seem slightly washed out, and when you turn the tablet you'll discover that the colors abruptly fade but are still visible at the widest viewing angle. And the touchscreen is uniformly responsive and reliable. But as much as I would like to equate the screens of the Kobo Arc 7 and the Hisense Sero 7 Pro, they differ in at least one important way. I found it unfortunately easy to damage the screen on my Kobo Arc 7. I don't know how, but my tablet now has a centimeter long diagonal crack in the upper central portion of the screen. I have not broken a screen in ages, and certainly did not mistreat the Arc 7, so I am not sure how the damage occurred. Was this bad luck, or is this a sign of poor construction quality? I don't know. But I do know that I am usually careful with my tablets, and that goes double for ones I hope to return. This tablet runs Android 4.2 Jelly Bean, but it doesn't look like what you would see on your average Android tablet. While the Arc 7 has the app menu, settings menus, and shortcut menus found on most Android 4.2 devices, it also eschews the usual home screen for a unique home screen that places your Kobo library front and center. This changes the Arc 7 from being an ordinary Android tablet into being more of an enhanced ebook reader. The Arc 7's home screen has 3 pages in a row (1-2-3), and you can move between them with lateral swipes. The first screen is the usual home screen full of widgets and icons, while the third home screen is used to show your entire Kobo ebook library: collections, archived titles, and everything you have not downloaded to the Arc 7. The second and primary home screen is used to show the ebooks you are reading right now as well as widgets which suggest titles from the Kobo ebookstore or show your latest reading statistics. This page is built around a unique vertical scrolling design which grows longer as you add more ebooks to your device. Don't worry; you can delete widgets and remove the ebooks as well. At the top of the screen is the usual notification bar found on Android 4.2 with the usual shortcut menu and notification menu, and across the bottom of the home screens a slot for an avatar photo and space for 4 app icons; users can add or remove the icons to suit themselves. Below that is a second menu bar which looks pretty much like the one found on other Android tablets, only with additional icons for voice search, search, and the app menu. In terms of apps, the Arc 7 ships with the usual Google bloatware as well as a few useful additions, including Feedly, Firefox, McAfee, Vudu, Pinterent, and other apps which can be downloaded from Google Play (see the screen shots for more detail). I went into this review knowing that Kobo had installed a custom home screen, but even so I was still confused at first. Setting up the Arc 7 as a tablet was easy, and so was adding my Google and Kobo accounts, but I had trouble figuring out where Kobo was hiding the several dozen ebooks I bought from them. I ended up having to download the user manual and search for the information I needed, at which point I learned that there was a third page to the home screen. In many ways the Arc 7 is an Android tablet but the design of the home screen, with its focus on ebooks, changes the Arc 7 from being an Android tablet to being an enhanced ebook reader. Sure, you can use the Arc 7 as an Android tablet but IMO it was developed with readers in mind, especially ones that buy from Kobo. Kobo has a specific idea of what an ebook should look like, but once I figured out how to disable their formatting decisions I discovered that the Arc 7 has a very nice reading app. In terms of formatting the reading app on the Arc 7 offers 2 margin options, 2 font choices (plus publisher's default), 3 background options, and there's an option to disable Kobo's default formatting. It also support bookmarks, highlights, public and private notes, and you can also elect to see the notes added by other readers. That is a rather limited selection of formatting options compared to my preferred 3rd-party reading apps and it's also fewer options than on the competing Kindle apps, though the Arc 7 does have some less obvious but still useful options like volume buttons doubling as page turn buttons, and others. And it is missing some options which I like, but in spite of (for example) the lack of my preferred ragged right justification option I found the reading app quite usable. I even bought the next title in a series I am reading, which says a lot for my willingness to continuing to use the app. Now if only Kobo would let me use the app for all of my ebooks, that would be nice. Curiously enough, the Arc 7 is set up to focus only on your Kobo library and not ebooks downloaded from elsewhere. Anything not bought at Kobo gets dragged into Google Play Books. I downloaded several ebooks from Feedbooks and I wasn't even given an option to open the ebooks in the Kobo app; my only option was to use Google Play Books (or download another app). I don't see this as an ideal choice on the part of Kobo, but there's not much I can do about it. Physically the Arc 7 is about the same width and height size as the Hisense Sero 7 Pro. It's on the large size for 7" Android tablets, which makes it difficult to hold the tablet in one hand, but I can theoretically hold it in my left hand and use the volume buttons to turn the pages, but I found that the buttons didn't stick out enough to make that a comfortable maneuver I had to grip the tablet too hard in order to trigger the button. So like many 7" tablets, this tablet is strictly a two-handed reading experience. The Kobo Arc 7 is more of a reading tablet than a media tablet so I could have skipped this section, but for the sake of completeness I did watch several videos. The Arc 7 comes with the stock media player found on most Android devices. Thanks to the quad-core CPU this tablet was more than capable of playing high resolution videos without issue, though the sound from the single speaker on the back was rather quiet. It was also quiet when I streamed a Youtube video, but I could hear enough to describe the audio quality as middling. Like the speakers on many budget tablets, it failed to properly express certain test words (like murphy's/herpes in this song, for example). With an Antutu benchmark score of 13,697, the Kobo Arc 7 falls solidly in the middle of the many budget Android tablets I have reviewed. It is a solidly performing tablet, and my experiences confirm that the Arc 7 has a decent quality CPU, RAM, storage, and graphics chip. In general, this is a good tablet - with one exception. I've had this tablet for nearly 2 weeks, and in that time I have noticed an issue with Wifi. On several different occasions the Arc 7 has taken far longer to download a app or ebook than I would think appropriate. I've downloaded numerous ebooks and several apps, and I have usually had to stop and wait for download to finish. I've also noticed that webpages and the Play Store app take a long time to load - more so than on my other budget Android tablets. And finally, the Arc 7 was unable to stream Amazon Instant Video. The trick worked and I was able to install Adobe Flash and the Dolphin web browser, but I couldn't get the video to show up on screen. Depending on how you use this tablet, the Wifi may or may not be a problem, but it is a concern for me. Kobo lists the battery life as being 9 hours, so my estimate of 4 hours of video time (with Wifi and backlight on) is about right. This battery life is not quite comparable to the 5 hour estimate for the $99 HP Mesquite Android tablet, and it is also slightly better than the 3 hour estimated battery of many of the sub-$100 Android tablets. Of course, all of those tablets cost considerably less than the Kobo Arc 7, but we knew that going in. And anyway, this tablet wasn't built to compete in the general tablet market. I knew going into this review that the $149 Kobo Arc 7 did not have the specs to justify the price, and I guessed that the performance would not be significantly better than the sub-$100 Android tablets I've been reviewing over the past few months. It does have decent performance, adequate storage, and a better than average VGA camera, but you can say that about pretty much any budget Android tablet, including models which are a lot cheaper. But none of that really matters, because Kobo wasn't trying to build the same Android tablet as everyone else. They weren't even trying to build an Android tablet, per se. Kobo was trying to build an enhanced ereader along the lines the Nook Color or Nook Tablet, but more specifically they were trying to build a device for Kobo customers and not your average Android tablet users, and they succeeded. This tablet is not for me, and that's okay. I'm not a regular Kobo customer, and I was never in the market for a Kobo-focused device. If you are a frequent customer at Kobo, and you expect that your main activity on the tablet will be reading and not games, video, social, or many other uses, then this could be the tablet for you. It's set up so your Kobo library is the focal point. Reading, sharing, and buying content from Kobo and only Kobo is its primary activity, with other activities like games, media, and web browsing coming in second. I know I'm making this sound like an ebook reader, and in many ways this is the tablet equivalent of one of Kobo's ebook readers, only with a 7" LCD screen. Obviously that begs the question: why release it at all given all the benefits of the E-ink screens on Kobo's ebook readers (which fills the same purpose). That's simple: not everyone likes E-ink, and some want color. My mother, for example, wanted my Kindle Fire HD rather than a Kindle ereader when her last device died. To put it another way, there are people who want a tablet which can be used as an ereader. The Kobo Arc 7 was designed with those folks in mind. Internationally: The Kobo website has an incomplete list of their retail partners in various countries. The list appears to reflect the retail partners that have this tablet in stock. Not all of Kobo's diverse collection of retail partners received their initial stock at the time I wrote this review, and were not listed. Dimensions: 122 x 194 x 10.05 mm. Sounds like the Kobo Arc (2012 model) provides better specs and sells for less. I wonder why you bought this inferior model for that much? The specs were known in advance, no? Because this model was the current one, and it had hardly any reviews. I had also planned to get the Arc 7HD and review it as well, but now I don’t think I need to. Now that you have pointed it out, I think I might get one. Even though it has limited storage the Arc with 16GB has a 1.3MP camera, about 13GB of accessible storage, and (probably) comparable performance. At $99 it’s a decent value. Okay, I just looked at a product listing for the Arc. It has a different interface and is really not the same tablet as the 2013 models. I’m going to have to get one to play with. My screen also cracked and I do not know how or when, I also treat mine very good. Most of the time I know how I broke something. This time I don’t. I just purchased…so just testing it now. I will use primarily as an dreaded. Have you used in sunlight? It should be bright enough, yes. Have had a Kobo eReader for many years and love it……A week ago I decided to buy a Kobo/android arc 7HD @ $ 109 (canadian) (good price)….was surprised to learn that I could not move ebooks directly from Abode Digital Editions to this Kobo/android Arc. I would suggest that Kobo stick to the eReader business which they are very good at….. I bought the Kobo Arc 7 yesterday during cyber Monday. I paid 79.00 cdn for it. i’m worried because all I want is an ereader as i already have an ipad. i want to be able to read it outside during a sunny day. Did I make the right choice? The screen glare with the Kobo Arc 7 is too much for reading on a sunny day or in a bright room. I just bought the Kobo Arc 7 because I wanted an ereader that could do more than my KoboTouch (e.g. internet access) allow me to read in the evenings and fit in my purse. The KoboTouch and other e-ink readers are better for reading outside on sunny days. As for downloading other ebooks, I found it easy to do on the Arc 7 (after watching a YouTube video on the subject). I just downloaded the file from a site like FeedBooks, went to the Kobo screen, to the Books catalogue screen and imported the content. I bought this mainly to use as a reader so I could download directly from the library especially when away on holidays for extended periods. I’m pleased with that function but find the battery life very very limited….no more then three hours…atrocious !…can’t spend the day on the beach reading? I didn’t see any battery issues; maybe you have an app which is misbehaving? My usual fix for that is to install an app like Deep Sleep. It forces all apps to go to sleep when the screen is off, and limits the apps to only waking up on a set schedule. I bought 3 of the Kobo arc 7 android tablets for myself and my daughters. The tablets have a habit of shutting down in the middle of use. Can be surfing the web or reading a downloaded book or playing a downloaded game. Shuts down even when the battery is over 60% and cannot be restarted using the button. It has to be plugged in to the charger till the screen turns on, then can be unplugged and used right away (because it didn’t need to be charged!) What can I do about this?? If this were to happen on a car trip and I couldn’t plug it in, I would be severely ticked!! Any advice welcome. I am having the same problem and it is very frustrating. My battery was just about fully charged when I turned it off last night and when I went to read on the bus this morning it wouldn’t even turn on! Very discouraging and makes me think I bought the wrong product so probably will look for something else. On m’a déconseillé de lire sur une tablette à cause d’une lumière bleutée qui peut causer des problèmes à mes yeux à long terme. Est-ce que la liseuse sur Kobo Arc 7 HD a ce type de lumière ou la vraie lumunosité des liseuses Kobo aura. I don’t know what color the backlight is on the Arc 7, but I do know there is a solution for the blue light problem. I actually quite like this Kobo Arc 7. I can read, I can surf the net – it’s really all i need. However, like other readers, mine developed a one inch crack ( and I am CAREFUL with it!) and now that crack has become a 4 inch crack. Its’ under a year old and Kobo is replacing it, but is the next one going to crack too? I had mine for a few months. The problems started with a software glitch then it stopped working all together. I can’t even charge the unit. So very sad this is the second Kobo i have bought in over a year. I have had my Arc 7 for just over 2 years and I love it! It does all that I wish – reading, surfing the net, reading my emails, and playing a few games. There have been isdues: About a year after I bought it, I was unable to get it to work. Turned out that the screen on the right had popped up just a bit, but enough to disrupt operations. Once I pushed the screen back in place it has worked fine, although it has popped a couple of other times (could this be the source of reported cracks?). 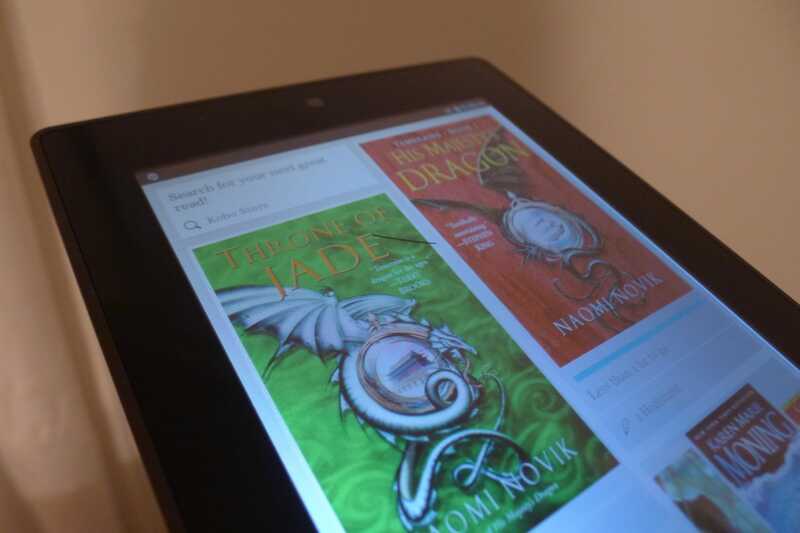 I tried Kobo Customer service, but they were notable to help me. My biggest current issue with this unit is that the Android operating system has not been updated since February 2014. This means that my tablet is not compatible with a lot of the new apps that i may be interested in, and as a result is becoming less and less relevant to me. I have tried contacting Kobo support to see when (or if!) there is going to be an update but have not received an answer. Which leads me to my biggest complaint: the lousy customer service from Kobo. I have never had any concern I have gone to customer service with resolved. In fact concerns (usually by email) have not received any response at all. I am just 2 weeks into my Arc 7hd and so far somewhat satisfied. Greatest issue is the battery power AND turning on the tablet. I notice a couple others have this issue also. Shut off the tablet with 98% power showing and 15 minute use on battery. 15 hours later I could not turn it back on and had to connect the charger to do so. This is a common occurance. anyone found an answer yet. My friend dropped my Kobo pad on a hardwood floor while it was plugged in to be recharged. The connection point broke. Is there a place that I can have it repaired or can I send it back to you or is there nothing to be done about it. I took it to a store to have it repaired and they suggested I send it back to you. Please respond as soon as possible as I use it every day and love it. This is a blog, and we are not affiliated with Kobo. But I can tell you that repair costs usually exceed the price of a replacement. Have not had my kobo arc for all that long. Now the screen will not work. Have tried many things. Not very good when you can’t get it to turn on and if it happens to come on you can’t turn the page,turn it off,turn off your book mark,and so on. Extremely frustrated. I do not think I will buy another Kobo. My kobo arc 7 was out of storage so I purchased a new sd card and installed it, but my Kobo still states no available space on this device. I have 29.85GB left on my new sd card and still no storage, HELP. Don’t buy one of these!! I bought mine in Feb 2015, it started giving me problems in March 2016. I couldn’t charge it. Thought it was my charger, so bought a new one…same result. I tried wriggling it around and finally was able to charge it by plugging in the charger at a slight angle to the right and sitting it against another object to maintain the charger. This worked for about 6 months, but each charge only lasted 2 hours. It started overheating and now I cannot retrieve anything, as it won’t charge at all. It was one month over the warranty when it started giving me problems, and I called Kobo right away, they said there was nothing to be done, it was over the warranty (by exactly 10 days!) Very displeased with this product and will NEVER buy another from this company. Has anyone else had their Kobo Arc 7 change from English to French without them doing it? If how do I get English back? The Arc 7 has been shut off for a quite a few months. Tried to turn it on and — nothing. Plugged in the charger. No response. Has the battery died beyond recovery? Probably. It is an old tablet.